Chef Mimi’s journey to becoming a pastry chef is an inspiring story – peppered with inspiration, perspiration, and a whole lot of determination. As one of Singapore’s premiere pastry chefs, Chef Mimi is surprisingly candid about the fact that she doesn’t have a sweet tooth. So, what inspires this dessert artisan to create tantalising cakes, macarons and crème brûlée, if not for a love of desserts? Chef Mimi’s journey to becoming a pastry chef is an inspiring story – with delightful highs, painful lows and heart-warming in-betweens. Chef Mimi’s beginnings as a chef started from watching her parents, especially her father, in the kitchen. As a child, young Mimi would stare mesmerised as her dad cooked his famous sambal egg, among other favourites. She remembers his amazing sense of taste, refined from a lifetime of cooking. This future chef had a natural inclination toward culinary exploits, spending her early years watching her parents whip up delicious food in the kitchen. She relates her experiences of secretly cooking when her parents weren’t home – experimenting with spices simply based on their colours, in her early (though not always successful) efforts to recreate her mum’s best dishes. Chef Mimi’s first attempt at baking came at the age of 12. After months of watching the popular Yan Can Cook and (especially) Chef Wan’s baking show on TV, the adolescent girl was raring to try her hand at this new craft. Her wish was granted when her father bought her a Tefal tabletop oven. The then-aspiring baker made her first cake in that oven, which turned out to be a sunken mess (because she used the wrong sugar) – but it was her first-ever cake and she was delighted with her creation. More importantly, young Mimi had learnt her first lesson in baking, a lesson that would prove instrumental in the years ahead as she learnt the ways of a pastry chef – your ingredients matter. From this experience, Chef Mimi discovered the importance of studying every detail and quality of each ingredient available to her. Her mind transformed into a repository of colours, tastes and textures, as she memorised how every ingredient could add (or subtract) from a baked creation. After excelling in pastry and baking at SHATEC, Mimi was upbeat about her prospects. Getting recognised in a then-male dominated industry though, would prove a challenge that would test more than her culinary abilities. Besides feeling like the odd one out among her male peers, work was very physical. As a pastry cook, Mimi would carry 25kg bags every day, working from daybreak till night, with no rest days for months at a stretch. There were no leniencies afforded to her just because she was a girl, nor did she wish to be treated differently anyway. All she wanted was for the opportunity to prove herself. And she was rewarded for standing out, with an exhilarating rise from Pastry Cook, to Chef de Partie, Pastry Sous Chef, Head Chef and eventually, Executive Sous Chef. A mad (pastry) scientist, or detailed architect? Chef Mimi’s creations are as beautiful to savour, as they are to look at. But what drives this chef to create desserts of impeccable quality? To Chef Mimi, the answer is simple. An intrinsic fascination with the science of ingredients, a vivid imagination that conjures up new recipes 24/7, an insatiable need to create, and an unflinching dedication to quality. Chef Mimi was invited to the UFS kitchen and given ingredients to play with, an experience that she relished. “I enjoy experimenting with new ingredients, and was pleasantly surprised by some of the options available from UFS, especially Planta Margarine – which I now prefer over butter when creating some of my favourite cake recipes. 18 years into her journey in this industry, Chef Mimi is still excited about what each new day brings. These days, this chef spends just as much time mentoring aspiring chefs, as she does crafting new recipes, baking and tinkering to perfection. She enjoys sharing her recipes and techniques with future chefs, as well as the philosophies that have brought her success. 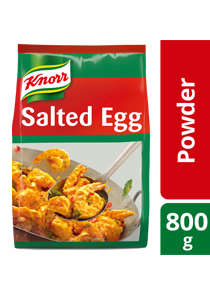 Learn how to make irresistibly unique pastries using Knorr Golden Salted Egg Powder and Planta Margarine. Get inspiration for some moist, flavourful cakes that’ll keep your diners coming back for more. From Mango Sticky Rice in a Cup to Pandan Chempedak Cream Puffs, discover some innovative modern art pastry recipes that’ll revitalise your menu!